Sometime last year I picked up a Cuisinart ice cream maker at a thrift store, thus launching my foray into frozen dessert experimentation. My favorite result to date is the Pickled Strawberry Ice Cream I made for "piescream sandwiches" last June, but the main hold-up preventing me from using the ice cream maker with more frequency is the time it takes to prepare a full-on custard ice cream-- often when I get the urge for a frozen treat, I want it then and now. So I've been seeking quicker recipes I can whip up within an hour. This "gelato" recipe via Food52 is a quick, no-cook affair, and can be easily adapted to whatever ingredients you have on hand. Originally made with strawberries, buttermilk, and sour cream, I used the sweet cherries, buttermilk, and Greek yogurt I already had in the fridge. My pizzelle maker is another one of those kitchen trinkets I like to put to use in creative ways. Back in January, my friends and I used it to make fortune cookies to pair with my friend Mike's homemade carrot/lemongrass and green tea/kombucha ice creams made for our Chinese New Year feast. This time, I adapted a Bees Knees recipe to make Honey Cornmeal Mini Cones, spiked with a dash of bourbon. If you don't want to shape them into cones (folding them right out of the oven requires a bit of a burned finger commitment), you can keep them in a round cookie shape and use them as a garnish in the ice cream dish. 1. 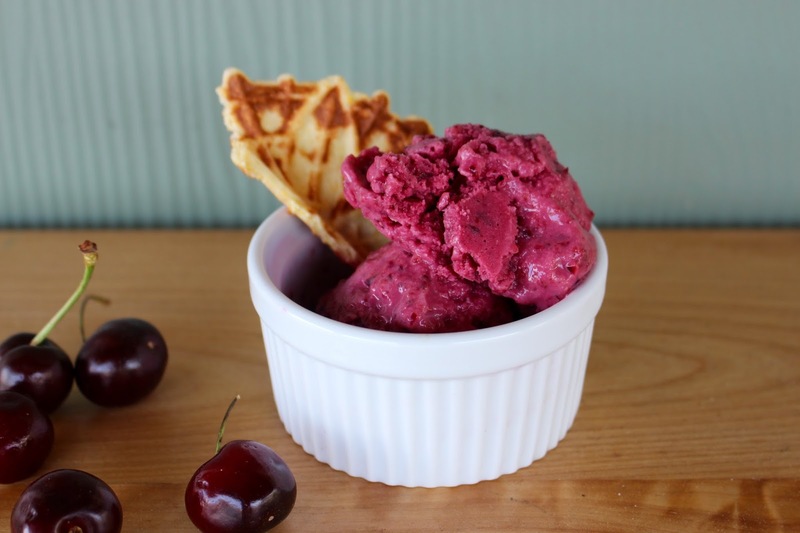 Purée the pitted cherries and sugar in a food processor or blender until smooth. 2. Add the salt, buttermilk, and yogurt and blend until combined. 3. Pour the blend into an ice cream maker and process according to the ice cream maker's instructions. 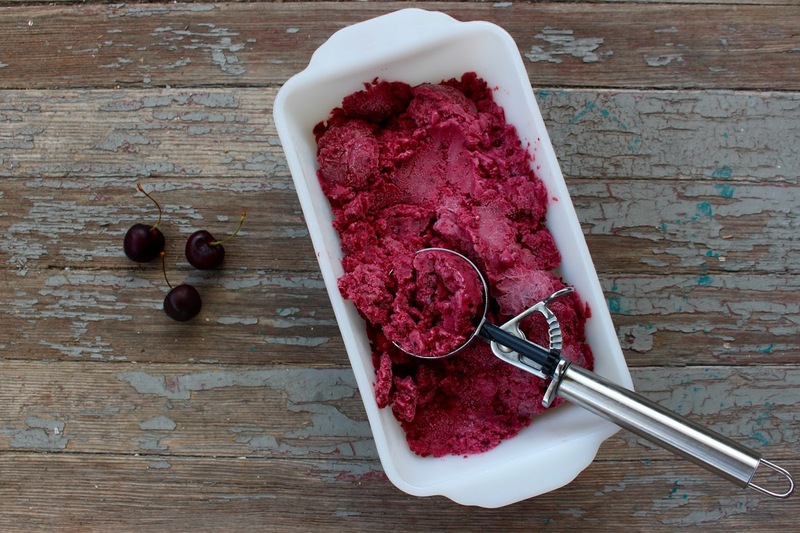 Once churned, chill in the freezer until ready to eat. 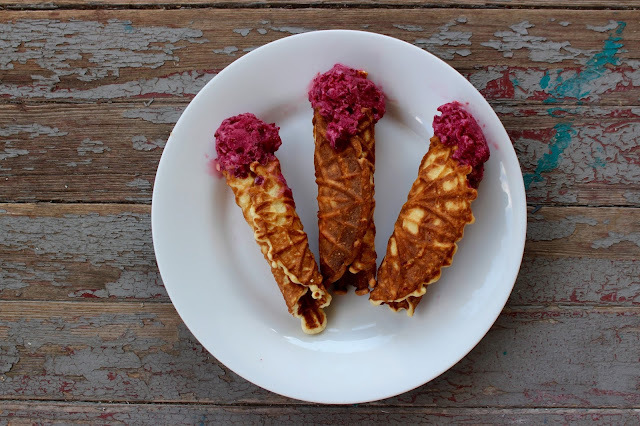 Serve with honey cornmeal ice cream cones (see recipe below). 1. Heat pizzelle or waffle cone maker. 2. In a saucepan, melt the honey with the 2 Tablespoons of butter and set aside. 3. In a small mixing bowl, combine egg, egg white, sugar, and bourbon. Stir in the salt and half of the flour, then mix in the melted honey butter. Beat in the rest of the flour and the cornmeal until smooth. 4. Scoop 1 1/2 Tablespoons batter into each side of the pizzelle maker and bake for about 1 minute. Remove cookie and immediately shape around your fingers or a spoon handle. 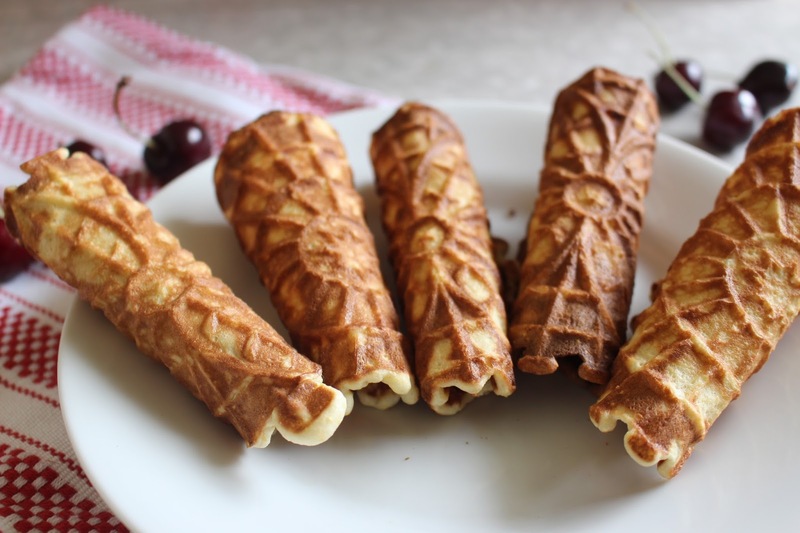 You may want to wear gloves as the pizzelles will be quite hot.